These are beautiful reminders of that area of the country, Kirt. Thanks for sharing these. I remember traveling by ferry and the driving where you wonder if people should be. It’s such beautiful country and the islands are so stunning!! Thanks for stopping by Dan!! Both fabulous art prints. 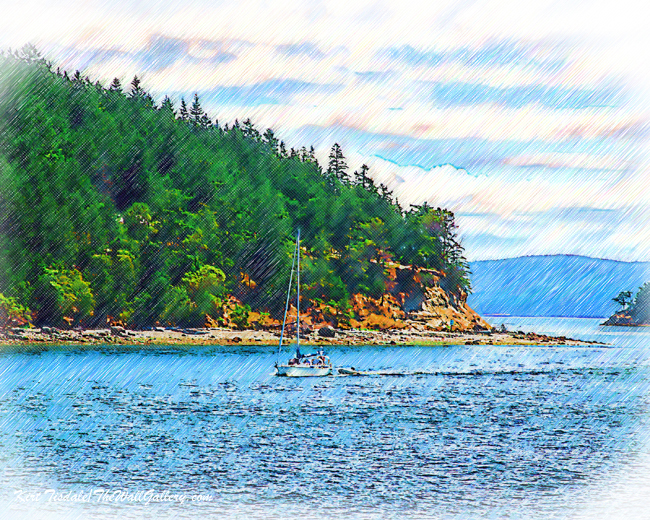 I’ve been to Friday Harbour and Roche Harbour a number of times by boat and love that area. Now I feel a bit homesick but you have evoked great memories. The west coast is an artist’s paradise! 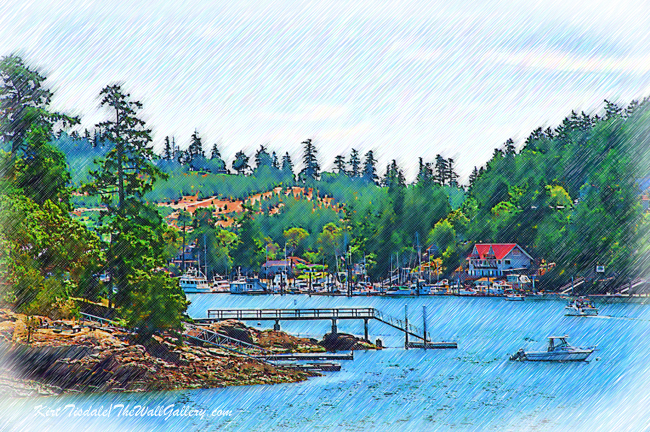 It truly is stunning country….I love Henry Island and going through Friday Harbor and Roche Harbor makes it even more magical!! We also went to an oyster farm just outside of Roche Harbor owned by my son-in-laws uncle….fascinating! Beautiful! Makes me want to visit that area! God bless! Thanks Ryan…stunning country!!! Have a great week….God bless!! Thank you very much Nancy….much appreciated!! Thank you very much Michelle!! I agree!! Thanks for stopping by Diane! Have a great week! Hope all is well on your coast…blessings! Thanks for the kind words, Lorrie! It is beautiful country. Have a great week!!! Beautiful sketches, Kirt. Thank you for sharing with us. Thank you very much for the feedback Amy…have a great rest the week!! I really like that effect for those type of scenes, Kirt. Add the crisp vibrant colors and it went together perfectly. Have a thriving Thursday. Hugs! Thank you very much for the compliment!! Much appreciated! Love these ‘sketches’. The affect suits the scenes very well!